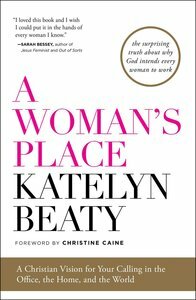 In A Woman's Place, Katelyn Beaty, print managing editor of Christianity Today and cofounder of Her.meneutics, insists it's time to reconsider women's work. She challenges us to explore new ways to live out the Scriptural call to rule over creation-in the office, the home, in ministry, and beyond. Starting with the Bible's approach to work-including the creation story, the Proverbs 31 woman, and New Testament models-Beaty shows how women's roles in Western society have changed; how the work-home divide came to exist; and how the Bible offers models of women in leadership. Readers will be inspired by stories of women effecting dynamic cultural change, leading institutions, and living out grand and beautiful vocations. Sure to spark discussion, A Woman's Place is a game-changing look at the importance of work for women and men alike. Katelyn Beaty is managing editor at "Christianity Today "magazine. Katelyn is the youngest managing editor in CT s history, as well as the first woman to serve as managing editor. She is the cofounder of Her.meneutics, a daily website covering news, cultural trends, and theology from the perspective of Christian women. A graduate of Calvin College, Katelyn lives outside Chicago, Illinois. A sought after speaker around the world, Christine Caine is passionate about the God life and seeing the local Church flourish across the earth. She is a gifted communicator with a heart for reaching the lost and helping people unlock their God-given potential. Christine is known for her fdtell-it-like-it-is,fd passionate, (and often humorous) way of communicating profound messages of hope and inspiration. Her message is impacting the lives of leaders, women, youth, the wider church and the unchurched across all continents. She is one of the pastors and directors of Equip & Empower Ministries, as well as the founder of The A21 Campaign. Together with her husband Nick, and daughters Catherine and Sophia, Christine spends much of the year travelling to reach the lost, strengthen leadership, champion the cause of justice and build the local Church globally. Her books include: A Life Unleashed, The Core Issue, Run To Win and Can I Have (and do) It All, Please?